Roadway pavement condition can impact the costs of passenger travel and freight transportation. Poor road surfaces cause additional wear and tear on vehicle suspensions, wheels, and tires. Significant congestion and delays can be attributed to vehicles slowing down in heavy traffic to avoid potholes or rough pavement. An increasing frequency of crashes also can be caused by unexpected changes in surface conditions because of reduction of road friction which affects the stopping ability and maneuverability of vehicles. This section examines the physical conditions of the Nation’s roadways, addressing both roadway surface conditions and other condition measures. This information is presented for Federal-aid highways only. Pavement data are not collected in the Highway Performance Monitoring System (HPMS) for roads functionally classified as rural minor collectors, rural local, or urban local. Separate statistics are presented for the National Highway System (NHS). Subsequent sections within this chapter explore the physical conditions of bridges and transit systems. Safety trends and system performance trends are discussed separately in Chapter 4 and Chapter 5. Pavement condition ratings presented in this section are derived from either the International Roughness Index (IRI) or the Present Serviceability Rating (PSR). The IRI objectively measures the cumulative deviation from a smooth surface in inches per mile. The PSR is a subjective rating system based on a scale of 0 to 5. HPMS coding instructions recommend the reporting of IRI data for all facility types. However, States are permitted to instead provide PSR data for roadway sections classified as rural major collectors, urban minor arterials, or urban collectors. The Federal Highway Administration (FHWA) adopted the IRI for the higher functional classifications because it is generally accepted worldwide as a pavement roughness measurement. The IRI system results in more consistent data for trend analyses and cross jurisdiction comparisons. A conversion table was utilized to translate PSR values into equivalent IRI values to classify mileage for this report. Exhibit 3-1 contains a description of qualitative pavement condition terms used in this report and corresponding quantitative PSR and IRI values. The translation between PSR and IRI is not exact. IRI values are based on objective measurements of pavement roughness, while PSR is a subjective evaluation of a broader range of pavement characteristics. The term “good ride quality” applies to pavements with an IRI value of less than 95 inches per mile. The term “acceptable ride quality” applies to pavements with an IRI value of less than or equal to 170 inches per mile, which also includes those pavements classified as having good ride quality. It is important to note that the specific IRI values associated with good ride quality and acceptable ride quality were adopted by the FHWA as pavement condition indicators for the NHS. These values are applied to all Federal-aid highways in this report, but States and local governments may have different standards of what constitutes acceptable pavement conditions, particularly for low-volume roadways that are not part of the NHS. * The rating thresholds for good and acceptable ride quality used in this report were initially determined for use in assessing pavements on the NHS. Some transportation agencies may use less stringent standards for lower functional classification roadways. Source: Highway Performance Monitoring System (HPMS). What are some measures of pavement condition other than IRI? Other principal measures of pavement condition or distress such as rutting, cracking, and faulting existed but were not included in HPMS until 2010, when the HPMS reporting requirements were modified to collect information on these distresses and other pavement-related data. At the time of this report, data available through the HPMS are incomplete. It is expected that national level summaries will be presented in the 2015 C&P Report. In addition to allowing more robust assessments of the current state of the Nation’s pavements, these new data will support the use of enhanced pavement deterioration equations in the HERS model, which will provide refined projections of future pavement conditions. Because pavements are continuously exposed to the environment, environmental conditions play a significant part in the ongoing deterioration of pavements. High volumes of traffic and increases in the volume of heavy traffic vehicles also contribute to the deterioration of pavements. Reconstruction, rehabilitation, or preventive maintenance actions can be taken to mitigate the deterioration caused by these factors. Since the impacts of traffic and the environment are cumulative, deterioration can happen rapidly and, if no action is taken, deterioration of the pavement can continue until the pavement can no longer support traffic loads. Construction of a new pavement and the major rehabilitation of a pavement are relatively expensive. Consequently, such actions may not be economically justified until the pavement section has deteriorated to a relatively bad condition. Such considerations are reflected in the investment scenarios presented in Part II of this report, which show that even if all cost-beneficial investments were made, at any given time a certain percentage of pavements would not meet the criteria for “acceptable ride quality”. Preventive maintenance actions are less expensive and can be used to maintain and temporarily improve the quality of a pavement section. However, preventive maintenance actions have shorter useful lives than reconstruction or rehabilitation actions; this shorter life results in a more rapid deterioration rate after they are implemented. Preventative maintenance actions are important to preserve the quality of a pavement section but cannot completely address pavement deterioration over the long term. More aggressive actions would eventually need to be taken to preserve pavement quality. Among the three major components of highway user costs measured in this report (travel time costs, vehicle operating costs, and crash costs), pavement condition has the most direct impact on vehicle operating costs in the form of increased wear and tear on vehicles and repair costs. Poor pavement can also impact travel time costs to the extent that road conditions force drivers to reduce speed. Additionally, poor pavement can increase the frequency of crash rates. Highway user costs are discussed in more detail in Chapter 7. Good ride quality and acceptable ride quality are defined based on a range of IRI values, and the impact of ride quality on highway user costs varies depending on where pavements fall within these categories. In general, pavements falling below the acceptable ride quality threshold would tend to have greater impacts on user costs than those classified as having acceptable or good ride quality. However, the relative impacts on user costs of a pavement with an IRI of 169 (acceptable) compared with a pavement with an IRI of 171 (not acceptable) would not be significant. The same would be true for pavements just above or below the standard for good ride quality (an IRI of less than or equal to 95). The impact of pavement ride quality on user costs tends to be higher on the higher functional classification roadways, such as Interstate System highways, than on the roadways with lower functional classifications, such as connectors. Vehicle speed can significantly influence the impact that poor ride quality has on highway user costs. For example, a vehicle encountering a pothole at 55 miles per hour on an Interstate highway would experience relatively more wear and tear than a vehicle encountering an identical pothole on a collector at 25 miles per hour. Poor ride quality would also tend to have a greater impact on Interstate highways due to their higher traffic volumes. The Interstate System supports the movement of passenger vehicles and trucks at relatively high speeds across the Nation. Poor ride quality can cause drivers to travel at a lower speed, thereby increasing the time of individual trips and adding to congestion. In the case of freight movement, this reduction in travel speed would add to the cost of the delivery of goods. Conversely, because traffic volumes and average speeds on collectors are lower to begin with, poor ride quality on such facilities would not have as great an impact on vehicle speeds as comparable conditions would on higher functional classification roadways. What performance measurement requirements for the National Highway System have been established by MAP-21? Under MAP-21, States are required to develop a risk- and performance-based asset management plan for the NHS to improve or preserve asset condition and system performance. Plan development process must be reviewed and recertified at least every 4 years. The penalty for failure to implement this requirement is a reduced Federal share for National Highway Performance Program (NHPP) projects in that year (65 percent instead of the usual 80 percent). What are some factors that should be considered in defining a state of good repair for transportation assets? There is broad consensus that our Nation’s transportation infrastructure falls short of a “State of Good Repair”; there is, however, no nationally accepted definition of exactly how the term should be defined in the context of various types of transportation assets. The condition of some asset types have traditionally been measured by multiple quantitative indicators, which are often weighted differently in the assessment process of different transportation asset owners. Other kinds of assets have traditionally been measured using a single qualitative rating, but this introduces subjectivity into the assessment process because different asset owners or different individual raters might apply such rating criteria differently. Thus, although a “State of Good Repair” goal is conducive to measurement, identifying investments that provide the greatest utility in meeting this goal would require consideration of a broad range of metrics within the context of sound asset management principles. Investment decisions should take into account the life-cycle costs of potential alternatives, including the capital costs, maintenance costs, and user costs associated with alternative strategies. In establishing performance targets for individual assets, it is important to consider how different metrics would reasonably be expected to vary over the asset’s life cycle in response to an analytically sound pattern of capital and maintenance actions. It is important that target thresholds be set at levels high enough to measure overall progress, but not so high that they might inadvertently produce suboptimal decision making. Another key consideration in setting performance targets is how particular assets are utilized. The physical condition of a heavily used asset will, by definition, impact more users than that of a lightly used asset. Applying higher performance standards to heavily used assets would help to capture their greater impact on the traveling public. Also, in selecting potential measures to target, it is important to recognize that some aspects of asset condition have a more direct impact on system users than others. Ideally, the performance measures selected for a given type of asset would roughly reflect the weighting of agency costs and user costs that would be determined as part of a full life-cycle cost analysis for that type of asset. Other fundamental questions to be answered are whether a particular asset is still serving the purpose for which it was originally intended and whether the long-term benefits that it provides exceed the cost of keeping it in service. A previous decision to invest in an asset should not automatically mean that the asset should be kept in a “State of Good Repair” in perpetuity, without considering the merits of taking the asset out of service. As shown in Exhibit 3-2, the share of vehicle miles traveled (VMT) on NHS pavements with acceptable ride quality has changed very little, from approximately 91 percent in 2000 to approximately 93 percent in 2010. However, the share of VMT on NHS pavements meeting the more rigorous standard of good ride quality has risen sharply over time, from approximately 48 percent in 2000 to approximately 60 percent in 2010. As noted above, the percentage of pavements with good ride quality is a subset of the percentage of pavements with acceptable ride quality. * The pavement data in this section reflect conditions as of December 31 of each year, as reported in the HPMS. In this report, these values are presented on a calendar-year basis, consistent with the annual Highway Statistics publication. Some other Department of Transportation documents, such as the FY 2011 Performance and Accountability Report, are based on a Federal fiscal year basis; values as of December 31 in one calendar year fall into the next fiscal year. For example, the 60 percent figure identified as good for calendar year 2010 in this exhibit, is reported as a fiscal year 2011 value in the FY 2011 Performance and Accountability Report. Source: Highway Performance Monitoring System as of July 2012. What goal was established by the Department of Transportation for pavement ride quality? The Department of Transportation’s FY 2011 Performance and Accountability Report presented a fiscal year (FY) 2011 target of 58 percent for the share of travel on the NHS on pavements with good ride quality; this corresponds to the calendar year 2010 data of 60 percent presented in this report, indicating that this goal was surpassed. What would be the percent VMT on “good” and “acceptable” pavements based on the NHS as newly defined under MAP-21? Combining data for NHS routes with other principal arterials not on the NHS prior to MAP-21, the share of VMT on the expanded NHS on good pavements is estimated to be 54.7 percent, while the share of VMT on acceptable pavements is estimated to be 88.8 percent. These values are lower than those reported for the old NHS, because principal arterials not included on the MAP-21 NHS tend to have lower ride quality than other NHS routes on average. The values are considered preliminary and may be revised once the expanded NHS has been coded into the HPMS. The USDOT FY 2013 Performance Plan sets a target for 2013 of having 57 percent of VMT on the expanded NHS to be on pavements with “good” ride quality; the target for 2012 is 56 percent. The HPMS collects ride-quality data only for Federal-aid highways, which include all functional classes except for rural minor collectors, rural local, and urban local. As described in Chapter 2, these three functional classifications account for approximately three-fourths of the total mileage on the Nation’s system, but carry less than one-sixth of the total daily VMT on the Nation’s roadway system. Because the focus of this report is on VMT-based measures of ride quality rather than mileage-based measures, the omission of these functional classes from the statistics in this section is less significant. As shown in Exhibit 3-3, for those functional classes for which data are collected, the VMT on pavements with good ride quality increased from 42.8 percent in 2000 to 50.6 percent in 2010. Between 2008 and 2010, the increase in VMT on pavements with good ride quality increased 4.2 percent. This improvement could be related to the impact of the American Recovery and Reinvestment Act, but further research and data collection is needed to confirm this relationship. The VMT on pavements meeting the standard of acceptable (which includes the category of good) ride quality decreased slightly from 85.4 percent in 2000 to 82.0 percent in 2010. 1 HPMS pavement reporting requirements were modified in 2009 to include bridges; features such as open grated bridge decks or expansion joints can greatly increase the IRI for a given section. 2 2010 data reflects revised HPMS functional classifications. Rural Other Freeways and Expressways have been split out of the Rural Other Principal Arterial category, and Urban Collect has been split into Urban Major Collector and Urban Minor Collector. 3 Totals shown reflect Federal-aid highways only and exclude roads classified as rural minor collector, rural local, or urban local, for which pavement data are not reported in HPMS. As noted in Chapter 2, rural areas contain about three-fourths of national road miles, but support only about one-third of annual national VMT. Consequently, pavement conditions in urban areas have a greater impact on the VMT-weighted measure shown in Exhibit 3-3 than do pavement conditions in rural areas. Pavement conditions are generally better in rural areas. For those functional systems for which data are available, the share of rural VMT on pavements with good ride quality rose from 55.2 percent in 2000 to 64.6 percent in 2010, while the portion of urban VMT on pavements with good ride quality increased from 35.0 percent in 2000 to 44.0 percent in 2010. The share of VMT on pavements with acceptable ride quality rose slightly between 2000 to 2010 in rural areas and declined slightly in urban areas. What potential impact on pavement performance might be expected due to the American Recovery and Reinvestment Act? As discussed in Chapter 6, a significant share of Recovery Act funding was directed toward pavement resurfacing. This funding is likely contributing to the increase in the percentage of VMT on pavements with good ride quality shown in Exhibit 3-3. However, IRI reporting in HPMS is conducted on a 2-year cycle, so some impacts of Recovery Act investment will not immediately be reflected in the data. Also, to the extent to which IRI was measured on sections while resurfacing projects were underway, the data may reflect much higher pavement roughness temporarily experienced by drivers during construction (when driving on grooved pavement, for example). Percentage of VMT on pavements rated as having good ride quality increased in both the rural and urban areas during the period from 2000 to 2010. In rural areas the increase was from 55.2 percent to 64.6 percent, while in the urban areas the increase was from 35.0 percent to 44.0 percent. The total increase in VMT on good ride quality pavements was from 42.8 percent in 2000 to 50.6 percent in 2010. The percentage of VMT on pavements with acceptable ride quality fell slightly from 85.4 percent in 2000 to 82.0 percent in 2010. A total of 91.1 percent of all VMT on the rural portion of the Interstate System occurred on pavements with acceptable ride quality; the comparable share on the urban portion of the Interstate System was 89.8 percent. Among all of the functional systems identified in Exhibit 3-3, the rural portion of the Interstate System had the highest percentage of VMT on pavements with good ride quality in 2010, at 79.1 percent, up from 69.6 percent in 2000. The share of urban Interstate System VMT on pavements with good ride quality from 2000 to 2010 rose from 43.6 percent to 64.6 percent, which represents the largest increase among the functional systems for which data are available. What is the significance of the differing results shown for VMT-weighted pavement condition shown in Exhibit 3-3 versus pavement condition on a mileage basis shown in Exhibit 3-4? While the percentage of pavements with good ride quality based on mileage has declined from 2002 through 2010, the percent of VMT on pavements with good ride quality improved during this period. This result appears consistent with a change in philosophy among many transportation agencies leading them to move away from a simple strategy of addressing assets on a “worst first” basis towards more comprehensive strategies aimed at targeting investment where it will benefit the most users. For example, while the Federal Highway Administration 1998 National Strategic Plan included a target for pavement ride quality for NHS mileage, by the time of the FHWA Fiscal Year 2003 Performance Plan, the target had been modified to a VMT-weighted measure. Exhibit 3-4 shows the pavement ride quality by functional classification from 2000 to 2010 based on mileage rather than VMT. On a mileage basis, the percentage of pavements with both good and acceptable ride quality declined between 2000 and 2010. Consistent with the VMT-weighted figures presented earlier, the share of pavements with good ride quality decreased for all functional classes except urban Interstate. The share of pavements with acceptable ride quality increased for rural principal arterials, rural minor arterials, urban Interstate, urban other freeway & expressway, and urban other principal arterials. Lane width affects capacity and safety. Narrow lanes have a lower capacity and can affect the frequency of crashes. As with roadway alignment, lane width is more crucial on functional classifications with higher travel volumes. Currently, higher functional systems such as the Interstate System are expected to have 12-foot lanes. As shown in Exhibit 3-5, approximately 99.0 percent of rural Interstate System miles and 98.6 percent of urban Interstate System miles had minimum 12-foot lane widths in 2008. Note: The most recent lane width data available through HPMS is for 2008; due to changes in the HPMS data structure, more recent data cannot yet be extracted. Source: Highway Performance Monitoring System as of December 2009. In 2008, approximately 49.8 percent of urban collectors have lane widths of 12 feet or greater, but approximately 19.3 percent have 11-foot lanes and 22.9 percent have 10-foot lanes; the remaining 8.1 percent have lane widths of 9 feet or less. Among rural major collectors, 40.5 percent have lane widths of 12 feet or greater, but approximately 25.0 percent have 11-foot lanes and 26.3 percent have 10-foot lanes. Roughly 8.1 percent of rural major collector mileage has lane widths of 9 feet or less. The term “roadway alignment” refers to the curvature and grade of a roadway; i.e., the extent to which it swings from side to side and points up or down. The term “horizontal alignment” relates to curvature (how sharp the curves are), while the term “vertical alignment” relates to gradient (how steep a slope is). Alignment adequacy affects the level of service and safety of the highway system. Inadequate alignment may result in speed reductions and impaired sight distance. Trucks are particularly affected by inadequate vertical alignment with regard to speed. Alignment adequacy is evaluated on a scale from Code 1 (best) to Code 4 (worst). Alignment adequacy is more important on roads with higher travel speeds and/or higher volumes (e.g., the Interstate System). Because alignment is generally not a major issue in urban areas, only rural alignment statistics are presented in this section. The amount of change in roadway alignment over time is gradual and occurs only during major reconstruction of existing roadways. New roadways are constructed to meet current vertical and horizontal alignment criteria and, therefore, do not generally have alignment problems except under very extreme conditions. As shown in Exhibit 3-6, in 2008, approximately 95.6 percent of rural Interstate System miles were classified as Code 1 for horizontal alignment and 92.7 percent as Code 1 for vertical alignment. In contrast, the percentage of rural minor arterial miles classified as Code 1 for horizontal and vertical alignment, respectively, were only 72.8 percent and 55.1 percent. Code 1 All curves and grades meet appropriate design standards. Code 2 Some curves or grades are below design standards for new construction, but curves can be negotiated safely at prevailing speed limits. Truck speed is not substantially affected. Code 3 Infrequent curves or grades occur that impair sight distance or severely affect truck speeds. May have reduced speed limits. Code 4 Frequent grades occur that impair sight distance or severely affect truck speeds. Generally, curves are unsafe or uncomfortable at prevailing speed limit, or the speed limit is severely restricted due to the design speed limits of the curves. Note: The most recent alignment data available through HPMS is for 2008; due to changes in the HPMS data structure, more recent data cannot yet be extracted. The data used to evaluate the condition of the Nation’s bridges is drawn from the National Bridge Inventory (NBI) and reflects information gathered by States during their periodic safety inspections of bridges. Bridge inspectors are trained to inspect bridges based on the criteria in the National Bridge Inspection Standards (NBIS), at a minimum. Regular inspections are required for all 604,485 bridges with spans of more than 20 feet (6.1 meters) located on public roads. All data presented in this section are from the NBI database as of December 2010. Some of the statistics presented in this section are based on actual bridge counts, and others are weighted by bridge deck area (taking bridge size into account) or by average daily traffic (ADT). ADT represents the number of vehicles crossing a structure on a typical day, but does not reflect the length of the structure crossed. In contrast, the VMT-weighted figures for pavements presented in the previous section take into account both the number of vehicles and the distance they travel. How often are the bridges inspected? Most bridges in the NBI are inspected once every 24 months. Structures with advanced deterioration or other conditions warranting close monitoring may be inspected more frequently. Certain types of structures in satisfactory or better condition—also considering other factors, including but not limited to structure type and description, structure age, and structure load rating—may receive an exemption from the 24-month inspection cycle. With FHWA approval, these structures may be inspected at intervals that do not exceed 48 months. A discussion of the criteria can be found in Technical Advisory 5140.21, subparagraph 7 of Varying the Frequency of Routine Inspection (http://staffnet/pgc/results.cfm?id=2341). Approximately 83 percent of bridges are inspected once every 24 months, 12 percent are inspected on a 12-month cycle, and 5 percent are inspected on a maximum 48-month cycle. What makes a bridge structurally deficient, and are structurally deficient bridges unsafe? Structurally deficient bridges are not inherently unsafe. Bridges are considered structurally deficient if significant load-carrying elements are found to be in poor or worse condition due to deterioration and/or damage, or if the adequacy of the waterway opening provided by the bridge is determined to be extremely insufficient to the point of causing intolerable roadway traffic interruptions. The classification of a bridge as structurally deficient does not imply that it is likely to collapse or that it is unsafe. By conducting properly scheduled inspections, unsafe conditions may be identified; if the bridge is determined to be unsafe, the structure must be closed. A deficient bridge, when left open to traffic, typically requires significant maintenance and repair to remain in service and eventual rehabilitation or replacement to address deficiencies. To remain in service, structurally deficient bridges often have weight limits that restrict the gross weight of vehicles using the bridges to less than the maximum weight typically allowed by statute. How does a bridge become functionally obsolete? Functional obsolescence is a function of the geometrics of the bridge in relation to the geometrics required by current design standards. In contrast to structural deficiencies, which are generally the result of deterioration of the conditions of the bridge components, functional obsolescence generally results from changing traffic demands on the structure. Facilities, including bridges, are designed to conform to the design standards in place at the time they are designed. Over time, improvements are made to the design requirements. As an example, a bridge designed in the 1930s would have shoulder widths in conformance with the design standards of the 1930s, but current design standards are based on different criteria and require wider bridge shoulders to meet current safety standards. The difference between the required, current-day shoulder width and the 1930s’ designed shoulder width represents a deficiency. The magnitude of these types of deficiencies determines whether a bridge is classified as functionally obsolete. The primary considerations in classifying structural deficiencies are the bridge component condition ratings. The NBI database contains condition ratings on the three primary components of a bridge: deck, superstructure, and substructure. The bridge deck is the surface on which vehicles travel and is supported by the superstructure. The superstructure transfers the load of the deck and bridge traffic to the substructure, which provides support for the entire bridge. If a bridge has issues that would warrant classification as both structurally deficient and functionally obsolete, which classification takes precedence? In such cases, the standard NBI data reporting convention is to identify the bridge as structurally deficient because structural deficiencies are considered more critical. Thus, while a significant percentage of bridges classified as structurally deficient will also have functional issues in need of correction, bridges classified as functionally obsolete do not have significant structural deficiencies. Condition ratings have been established to measure the state of bridge components over time in a consistent and uniform manner. Bridge inspectors assign condition ratings by evaluating the severity of any deterioration of bridge components relative to their as-built condition, and the extent to which this deterioration affects the performance of the component being rated. These ratings provide an overall characterization of the general condition of the entire component being rated; the condition of specific individual bridge elements may be higher or lower. Exhibit 3-7 describes the bridge condition ratings in more detail. 8 Very Good No problems noted. 7 Good Some minor problems. 6 Satisfactory Structural elements show some minor deterioration. 5 Fair All primary structural elements are sound but may have minor section loss, cracking, spalling, or scour. 4 Poor Advanced section loss, deterioration, spalling, or scour. 3 Serious Loss of section, deterioration, spalling, or scour have seriously affected primary structural components. Local failures are possible. Fatigue cracks in steel or shear cracks in concrete may be present. 2 Critical Advanced deterioration of primary structural elements. Fatigue cracks in steel or shear cracks in concrete may be present or scour may have removed substructure support. Unless closely monitored, it may be necessary to close the bridge until corrective action is taken. 1 Imminent Failure Major deterioration or section loss present in critical structural components, or obvious loss present in critical structural components, or obvious vertical or horizontal movement affecting structural stability. Bridge is closed to traffic, but corrective action may be sufficient to put the bridge back in light service. 0 Failed Bridge is out of service and is beyond corrective action. * The term “section loss” is defined in The Bridge Inspector's Reference Manual (BIRM) Publication No. FHWA NHI 03-001 as the loss of a (bridge) member’s cross-sectional area usually by corrosion or decay. A “spall” is a depression in a concrete member resulting from the separation and removal of a volume of the surface concrete. Spalls can be caused by corroding reinforcement, friction from thermal movement, and overstress. The term “scour” refers to the erosion of streambed or bank material around bridge supports due to flowing water. Source: Recording and Coding Guide for the Structure Inventory and Appraisal of the Nation's Bridges, Report No. FHWA-PD-96-001. The condition ratings for bridges in the Nation are shown in Exhibit 3-8. When a primary component of a structure has a rating of 4 or lower, it is considered to be structurally deficient. A structural deficiency does not indicate that a bridge is unsafe but instead indicates the extent to which a bridge has depreciated from its original condition when first built. Once bridge components become structurally deficient, the bridge may experience reduced performance in the form of lane closures or load limits. Bridges are closed to traffic if they have components in such disrepair that there is a safety risk. * Percentages are based on deck ratings for 468,466 bridges, superstructure ratings for 473,116 bridges, and substructure ratings for 473,305 bridges. These percentages exclude 124,823 culverts (self-contained units located under roadway fill that do not have a deck, superstructure, or substructure), other structures for which these ratings are nonapplicable, and other structures for which no value was coded. Source: National Bridge Inventory, December 2010. How many of bridges reported in the NBI are currently closed? Of the structures reported in the NBI, 3,585 (0.6 percent) are currently closed to traffic. Closed bridges are generally removed from the inventory 5 years after closure, unless there are special circumstances, such as active work underway that will permit the structure to be reopened in the future. Approximately 58.9 percent of the bridges rated had bridge decks with ratings of 7 or better. Weighting bridges by deck area changes this value to 59.4 percent, suggesting that larger bridges are in slightly better shape on average; the corresponding value weighted by ADT is 55.6 percent, suggesting that bridge decks on heavily traveled bridges are in slightly worse shape on average. The share of bridge decks with ratings of 4 or worse was 5.5 percent based on raw bridge counts or weighted by ADT; the corresponding figure weighted by deck area was 5.0 percent. Weighted by deck area, the share of bridge superstructures with ratings of 7 or better was 65.4 percent, while the comparable value for bridge substructures was 64.8 percent. The share of bridge superstructures weighted by deck area having a rating of 4 or worse was 3.8 percent, compared to 3.5 percent for bridge substructures. The percentages shown in Exhibit 3-8 do not reflect culverts, which do not have a deck, superstructure, or substructure, but instead are self-contained units typically located under roadway fill. Appraisal ratings compare existing bridge characteristics to the most current standards used for highway and bridge design. Appraisal ratings are a factor used in the classification of bridges as structurally deficient or functionally obsolete. Exhibit 3-9 describes appraisal rating codes in more detail. 9 Superior to present desirable criteria. 8 Equal to present desirable criteria. 7 Better than present minimum criteria. 6 Equal to present minimum criteria. 5 Somewhat better than minimum adequacy to tolerate being left in place as-is. 4 Meets minimum tolerable limits to be left in place as-is. 3 Basically intolerable requiring a high priority of corrective action. 2 Basically intolerable requiring a high priority of replacement. 1 This value of rating code is not used. Source: Source: Recording and Coding Guide for the Structure Inventory and Appraisal of the Nation's Bridges, Report No. FHWA-PD-96-001. The primary considerations in determining functional obsolescence are the deck geometry rating, the underclearance rating, and the rating of the alignment of the roadway approaching the bridge. A deck geometry rating reflects the width of the bridge, the minimum vertical clearance over the bridge, the ADT, the number of lanes on the structure, whether the structure carries two-way or one-way traffic, and the functional classification of the structure. As noted above, appraisal ratings are used to compare existing characteristics of a bridge to the current standards used for highway and bridge design; thus, when a more stringent standard is adopted, this leads to downward adjustments to the ratings of existing bridges that do not meet the new standard. For example, a bridge built to the design standards for deck width in the 1960s may not meet the current design standards for deck width, and thus would receive a lower deck geometry rating. Underclearance appraisals consider both the vertical and horizontal distances measured from a roadway or railway passing beneath a bridge to the nearest bridge component. The functional classification of the route passing under the bridge is also considered, along with its Federal-aid designation and defense categorization (i.e., whether the bridge crosses over a Strategic Highway Network [STRAHNET] route). Approach alignment ratings differ from the appraisal ratings previously discussed in that, rather than comparing approach roadway alignment with a specific set of standards, they are determined by comparing the existing approach roadway alignment to the general alignment for the section of highway on which the bridge is located. Disparities in alignment between a bridge and its approach roadway can pose a hazard to drivers. Exhibit 3-10 shows the distribution of appraisal ratings for deck geometry, underclearance, and approach alignment. Approximately 34.3 percent of bridges received a deck geometry performance rating of 4 or less, indicating problems that generally would not be correctable unless the structure were replaced. The comparable figure weighted by ADT is 29.5 percent because deck geometry adequacy is more of a problem on higher-traveled routes, on average. Approximately 1.0 percent of approach alignments were rated as having ratings of 4 or worse when weighted by ADT; for those bridges for which underclearance adequacy was evaluated, 49.4 percent had ratings of 4 or lower. * Percentages are based on deck geometry ratings for 519,386 structures, approach alignment ratings for 602,100 structures, and underclearance ratings for 101,860 structures. Underclearance adequacy is rated only for those bridges crossing over a highway or railroad. Load-carrying capacity does not influence the assignment of the condition ratings, but it does factor into the structural evaluation appraisal rating. This is calculated according to the capacity ratings for various categories of traffic in terms of ADT. Depending on how low its rating, a bridge can be classified as functionally obsolete. A very low structural evaluation rating indicates that the load-carrying capacity is too low and the structure should be replaced; in this case, the bridge is classified as structurally deficient. Neither rating is indicative of a bridge that is unsafe, but rather is a measure of the bridge’s original design and the extent of the bridge’s depreciation relative to current design standards. The waterway adequacy appraisal rating describes the size of the opening of the structure with respect to the passage of water flow under the bridge. This rating, which considers the potential for a structure to be submerged during a flood event and the potential inconvenience to the traveling public, is based on criteria assigned by functional classification. A sufficiently low waterway adequacy rating for a bridge can result in the bridge being classified as structurally deficient. Exhibit 3-11 identifies the percentage of all bridges classified as structurally deficient or functionally obsolete based on the number of bridges, bridges weighted by deck area, and bridges weighted by ADT. The total number of bridges has grown over time; totals for individual years are identified in Chapter 2. Based on raw bridge counts, approximately 11.7 percent of bridges were classified as structurally deficient in 2010, and 14.2 percent were classified as functionally obsolete. Weighted by deck area, the comparable shares were 9.1 percent structurally deficient and 19.8 percent functionally obsolete. The differences are even more pronounced when bridges are weighted by ADT, as this adjustment results in a structurally deficient share of 6.7 percent and a functionally obsolete share of 21.5 percent. Since 2000, the total share of deficient bridges weighted by deck area has decreased from 31.6 percent to 28.9 percent, representing an overall improvement in the condition of the Nation’s bridges. Whether considering raw bridge counts, deck-area-weighted values, or ADT-weighted values, more progress was made during this period in reducing the percentage of structurally deficient bridges than in reducing the share of functionally obsolete bridges. Exhibit 3-12 identifies the percent of bridges on the NHS classified as structurally deficient or functionally obsolete based on the number of bridges, bridges weighted by deck area, and bridges weighted by ADT. The total number of NHS bridges for individual years are identified in Chapter 2. What goal was established by the Department of Transportation for NHS bridges? The Department of Transportation’s FY 2010 Performance Report presented a FY 2010 target of a maximum 28.9 percent for the share of deck area on NHS bridges that were rated as deficient. The target was met and exceeded. The final percentage was 25.2 percent. In 2010, approximately 5.1 percent of NHS bridges were classified as structurally deficient and 16.3 percent were classified as functionally obsolete, resulting in a total of 21.4 percent of the 116,669 NHS bridges classified as deficient; the comparable values weighted by deck area and ADT were 28.7 percent and 25.7 percent, respectively. This suggests that there is a greater-than-average concentration of deficiencies on heavily traveled and larger bridges, respectively. The FHWA has adopted deck-area weighting for use in agency performance planning in recognition of the significant logistical and financial challenges that may be involved in addressing deficiencies on larger bridges. The share of NHS bridges weighted by deck area that are classified as structurally deficient remained essentially the same from 2000 (8.7 percent) to 2010 (8.3 percent), while the deck-area weighted share classified as functionally obsolete decreased from 22.0 percent to 20.3 percent during the same period. NHS routes tend to carry significantly more traffic than average roads, and functional obsolescence remains a significant challenge on NHS bridges. What provisions are in MAP-21 to support and improve the performance level of bridges on the NHS and on the Interstate System? If more than 10% of the total deck area of NHS bridges in a State is on structurally deficient bridges for three consecutive years, the State must devote NHPP funds in an amount equal to 50% of the State's FY 2009 Highway Bridge Program apportionment to improve NHS bridge conditions during the following fiscal year (and each year thereafter if the condition remains below the minimum standard). Additionally, the provisions for the National Bridge and Tunnel Inventory and Inspection Standards recognize the importance of the safety of the traveling public as well as support the efforts to improve the condition of the Nation’s bridges. The purposes of this provision include providing a basis for a data-driven and risk-based approach and a cost-effective strategy to bridge investment, and establishing and maintaining existing minimum Federal standards related to the inventory and safety inspection of bridges on all public roads. The STRAHNET system is a key subset of the NHS. The physical composition of this system was described in Chapter 2 and the condition of the pavement portion was presented earlier in this chapter. The share of structurally deficient bridges decreased from 6.2 percent in 2000 to 4.9 percent in 2010. The share of functionally obsolete bridges decreased from 17.2 percent in 2000 to 16.9 percent in 2010. The share of bridges either structurally deficient or functionally obsolete decreased from 23.4 percent in 2000 to 21.8 percent in 2010. These data are shown in Exhibit 3-13. Based on the number of bridges, the total percentage of structurally deficient and functionally obsolete bridges on the Nation’s roadways decreased from 30.8 percent in 2000 to 25.9 percent in 2010. The percentage of structurally deficient bridges for most functional classes decreased between 2000 and 2010, with the exception of rural Interstate System bridges. As shown in Exhibit 3-14, the share of rural Interstate System bridges classified as structurally deficient increased from 4.0 percent to 4.5 percent during this period. The share of bridges classified as functionally obsolete decreased from 15.5 percent in 2000 to 14.2 percent in 2010. Source: National Bridge Inventory, December, 2010. Among the individual functional classes, the highest percentage observed in 2010 for structurally deficient bridges was 17.9 percent for rural local; the rural portion of the Interstate System and rural other principal arterial roadways tied for the lowest percentage of structurally deficient bridges at 4.5 percent. Urban minor arterials had the highest share of functionally obsolete bridges in 2000, at approximately 28.6 percent. The functional class with the lowest share of functionally obsolete bridges in 2010 was rural other principal arterials with 8.5 percent; rural other principal arterials have continuously had the lowest share of functionally obsolete bridges since 2000. As discussed in Chapter 2, the entity responsible for the maintenance and operation of a bridge is characterized as its owner. A secondary agency (such as the State) may perform maintenance and operation work under an interagency agreement with the owner (such as a local community). However, such agreements do not transfer ownership and, therefore, do not negate the responsibilities of the bridge owners to ensure that the maintenance and operation of all bridges that they own are in compliance with Federal and State requirements. Each State has the responsibility for inspection of all bridges in that State except for tribally or Federally owned bridges. Bridge deficiencies by ownership are examined in Exhibit 3-15. Of the relatively small number of privately owned bridges reported in the NBI—0.3 percent of the total number of bridges—64.6 percent were classified as deficient in 2010. State-owned bridges had the lowest share of structurally deficient bridges in 2010, at approximately 7.9 percent. Bridges owned by local governments had the lowest share of functionally obsolete bridges, at 12.1 percent. These findings are consistent with the types of bridges owned by the different levels of government; local governments tend to own smaller bridges with lower traffic levels than average, for which functional obsolescence is less of an issue. * Note that these data only reflect bridges for which inspection reports were submitted to the NBI. An unknown number of privately owned bridges are omitted. Exhibit 3-16 identifies the age composition of Interstate System bridges, NHS bridges, and all total highway bridges in the Nation. As of 2010, approximately 37.7 percent of the Nation’s bridges were between 26 and 50 years old; this share was higher for NHS bridges, at 52.7 percent, while 68.4 percent of the Interstate bridges fell into this age range. Approximately 68.5 percent of all bridges are 26 years old or older. The percentage of NHS and Interstate bridges in this group are 73.6 percent and 82.8 percent, respectively. The largest number of bridges for each system is in the 26- to 50-years-of-age group: 37.7 percent of all bridges, 52.7 percent of NHS bridges, and 68.4 percent of Interstate bridges. The large number of bridges with ages of 26 years to 50 years has potential implications in terms of long-term bridge rehabilitation and replacement strategies because the need for such actions may be concentrated within certain time periods rather than being spread out evenly, which might be the case if the original construction of bridges had been spread out more evenly over time. However, a number of other variables such as maintenance practices and environmental conditions also affect when future capital investments might be needed. What is the average age of the Nation’s bridges and has it changed since 2000? The average year of construction in 2000 was 1963 which meant the average age was 37 years. In 2010, the average year of construction was 1971 which results in an average age of 39 years. Therefore, the overall age of the Nation’s bridges increased 2 years over a period of 10 years. In 2000, there were 588,844 bridges listed in the National Bridge Inventory (NBI). Approximately 67.2 percent of these bridges were more than 25 years old and 26.2 percent were over 50 years in age. By 2010, the number of bridges in the NBI increased to 604,485 bridges. Of these, 68.5 percent were older than 25 years and 30.8 percent were over 50 years old. Exhibit 3-17 identifies the distribution of bridge deficiencies within the age ranges presented in Exhibit 3-16. The percent of bridges classified as either structurally deficient or functionally obsolete generally tends to rise as bridges age. Among Interstate System bridges, 22.0 percent of the bridges constructed between 26 and 50 years ago were classified as deficient; this share rose to 34.5 percent for Interstate System bridges constructed between 51 and 75 years ago. Note that some existing bridges were absorbed into the Interstate System at the time it was designated; some of these structures remain in service today. Of the 604,485 bridges in the NBI, approximately 0.29 percent are registered as historic and an additional 0.64 percent are eligible to be registered. Some historic bridges carry significant traffic volumes; over 17 percent of the bridges on the historic register are on principal arterials. Bridges do not have to be extremely old to be classified as historic. Approximately 9.5 percent of the registered historic bridges are 50 years old or younger, well within the typical useful lifespan of a bridge; approximately 4.1 percent are 10 years old or less. Of the registered historic bridges, 33.3 percent are classified as structurally deficient and 40.2 percent are classified as functionally obsolete. At some time, it will be necessary to take mitigation actions on those bridges classified as structurally deficient; however, mitigation actions on the bridges classified as functionally obsolete may not be possible due to their historic classification. These bridges are still open to vehicular traffic even though, in some cases, heavy trucks and similar vehicles may not be allowed to use a particular historic bridge. The age of a bridge structure is one indicator of its serviceability. However, a combination of several factors impacts the serviceability of a structure, including the original type of design; the frequency, timeliness, effectiveness, and appropriateness of the maintenance activities implemented over the life of the structure; the loading the structure has been subject to during its life; the climate of the area where the structure is located; and any additional stresses from events such as flooding to which the structure has been subjected. As an example, two structures built at the same time, using the same design standards, and in the same climate area can have very different serviceability levels. The first structure may have had increasing loads due to increased heavy truck traffic, lack of maintenance of the deck or the substructure, or lack of rehabilitation work. The second structure may have had the same increases in heavy truck traffic but received correctly timed preventive maintenance activities on all parts of the structure and proper rehabilitation activities. In this case, the first structure would have a very low serviceability level while the second structure would have a high serviceability level. The condition and performance of the U.S. transit infrastructure should ideally be evaluated by how well it supports the objectives of the transit agencies that operate it. Presumably these objectives include providing fast, safe, cost-effective, and comfortable service that takes people where they want to go. However, the degree to which transit service meets these objectives is difficult to quantify and involves trade-offs that are outside the scope of Federal responsibility. 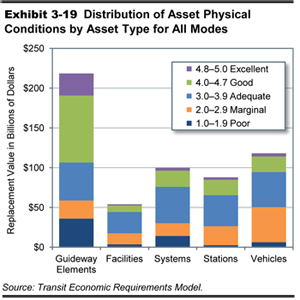 This section reports on the quantity, age, and physical condition of transit assets because these factors determine how well the infrastructure can support any agency’s objectives and set a foundation for uniform, consistent measurement. The assets in question include vehicles, stations, guideway, rail yards, administrative facilities, maintenance facilities, maintenance equipment, power systems, signaling systems, communication systems, and structures that carry both elevated and subterranean guideway. Chapter 5 addresses issues relating to the operational performance of transit systems. The FTA uses a numerical condition rating scale ranging from 1 to 5, detailed in Exhibit 3-18, to describe the relative condition of transit assets. A rating of 4.8 to 5.0, or “excellent,” indicates that the asset is in nearly new condition or lacks visible defects. At the other end of the scale, a rating of 1.0 to 1.9, or “poor,” indicates that the asset needs immediate repair and is not capable of supporting satisfactory transit service. Excellent 4.8–5.0 No visible defects, near-new condition. Good 4.0–4.7 Some slightly defective or deteriorated components. Adequate 3.0–3.9 Moderately defective or deteriorated components. Marginal 2.0–2.9 Defective or deteriorated components in need of replacement. Poor 1.0–1.9 Seriously damaged components in need of immediate repair. Source: Transit Economic Requirements Model. The FTA uses the Transit Economic Requirements Model (TERM) to estimate the conditions of transit assets for this report. This model consists of a database of transit assets and deterioration schedules that express asset conditions principally as a function of an asset’s age. Vehicle condition is based on an estimate of vehicle maintenance history and major rehabilitation expenditures in addition to vehicle age; the conditions of wayside control systems and track are based on an estimate of use (revenue miles per mile of track) in addition to age. For the purposes of this report, the state of good repair was defined using TERM’s numerical condition rating scale. Specifically, this report considers an asset to be in a state of good repair when the physical condition of that asset is at or above a condition rating value of 2.5 (the mid-point of the marginal range). An entire transit system would be in a state of good repair if all of its assets have an estimated condition value of 2.5 or higher. The State of Good Repair benchmark presented in Chapter 8 represents the level of investment required to attain and maintain this definition of a state of good repair by rehabilitating or replacing all assets with estimated condition ratings that are less than this minimum condition value. FTA is currently developing a broader definition of a state of good repair to use as a basis for administering MAP-21 grant programs and requirements that are intended to foster better infrastructure re-investment practices across the industry. This definition may not be the same as the one used in this report. Typical deterioration schedules for vehicles, maintenance facilities, stations, train control systems, electric power systems, and communication systems have been estimated by FTA through special on-site engineering surveys. Transit vehicle conditions also reflect the most recent information on vehicle age, use, and level of maintenance from the National Transit Database (NTD); the information used in this edition of the C&P report is from 2010. Age information is available on a vehicle-by-vehicle basis from the NTD and collected for all other assets through special surveys. Average maintenance expenditures and major rehabilitation expenditures by vehicle are also available on agency and modal bases. For the purpose of calculating conditions, agency maintenance and rehabilitation expenditures for a particular mode are assumed to be the same average value for all vehicles operated by that agency in that mode. Because agency maintenance expenditures may fluctuate from year to year, TERM uses a 5-year average. The deterioration schedules applied for track and guideway structures are based on special studies. The methods used to calculate deterioration schedules and the sources of the data on which deterioration schedules are based are discussed in Appendix C.
Condition estimates in each edition of the C&P report are based on contemporary updated asset inventory information and reflect updates in TERM’s asset inventory data. Annual data from the NTD were used to update asset records for the Nation’s transit vehicle fleets. In addition, updated asset inventory data were collected from 30 of the Nation’s largest rail and bus transit agencies to support analysis of non-vehicle needs. Because these data are not collected annually, it is not possible to provide accurate time series analysis of non-vehicle assets. FTA is working to develop improved data in this area. Appendix C provides a more detailed discussion of TERM’s data sources. 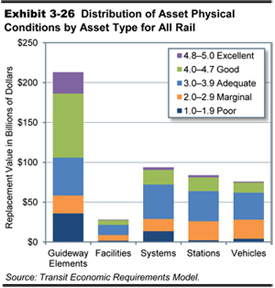 Exhibit 3-19 shows the distribution of asset conditions, by replacement value, across major asset categories for the entire U.S. transit industry. Condition estimates for assets in this report are weighted by the replacement value of each asset. This takes into account the fact that assets vary substantially in replacement value. So, a $1-million railcar in poor condition is a much bigger problem than a $1-thousand turnstile in similar condition. As an example of the calculation involved, consider: the cost-weighted average of a $100 asset in condition 2 and a $50 asset in condition 4 would be (100x2+50x4)/(100+50) = 2.67. The un-weighted average would be (2+4)/2 = 3. The total replacement value of the transit infrastructure in the United States was estimated at $678.9 billion in 2010. These estimates, presented in Exhibit 3-20, are based on asset inventory information contained in TERM. The estimates are reported in 2010 dollars. They exclude the value of assets that belong to special service operators that do not report to the NTD. Rail assets totaled $547.6 billion, or roughly 80 percent of all transit assets. Non-rail assets were estimated at $120.5 billion. Joint assets totaled $10.8 billion; they consist of assets that serve more than one mode within a single agency and can include administrative facilities, intermodal transfer centers, agency communications systems (e.g., telephone, radios, and computer networks), and vehicles used by agency management (e.g., vans and automobiles). Bus vehicle age and condition information is reported according to vehicle type for 2000 to 2010 in Exhibit 3-21. When measured across all vehicle types, the average age of the Nation’s bus fleet has remained essentially unchanged since 2004. Similarly, the average condition rating for all bus types (calculated as the weighted average of bus asset conditions, weighted by asset replacement value) is also relatively unchanged, remaining near the bottom of the adequate range for the last decade. The percentage of vehicles below the state of good repair replacement threshold (condition 2.5) has remained in the range of 10 to 12 percent for this same time period. Note that while this observation holds across all vehicle types, the proportion of full-size buses (the vehicle type that supports most fixed-route bus services) declined from 15.2 percent in 2008 to 12.5 percent in 2010. This reduction likely reflects the preliminary impacts of transit-related American Recovery and Reinvestment Act (Recovery Act) spending, a significant proportion of which was expended on full-sized buses. It is expected that this proportion will be shown to have declined further as newer vehicle age data become available that reflect Recovery Act related bus vehicle procurements on or after 2010. The Nation’s bus fleet has grown at an average annual rate of roughly 3 percent over the last decade, with most of this growth concentrated in three vehicle types including: large, 60-foot articulated buses; small buses of under 25 feet (frequently dedicated to flexible route bus services); and vans. The large increase in the number of vans reflects both the needs of an aging population (paratransit services) and an increase in the popularity of vanpool services. In contrast, the number of full- and medium-sized buses has remained relatively flat since 2000. 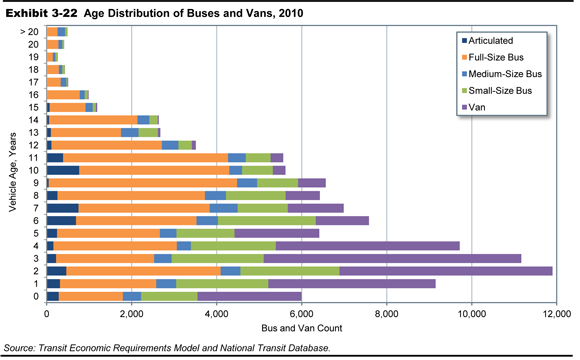 Similarly, Exhibit 3-22 presents the age distribution of the Nation’s transit buses and vans. Note here that full-size buses and vans account for the highest proportion (roughly 70 percent) of the Nation’s rubber tire transit vehicles. Moreover, while most vans are retired by age 6 and most buses by age 15, roughly 5 to 10 percent of these fleets remain in service well after their typical retirement ages. Furthermore, it appears the economic recession had an impact on the purchase of new vehicles and, thus, the age profile of buses and vans at transit agencies in the Nation. The peak of the age distribution reflects vehicles 2 years old, i.e., those purchased between July 1, 2007, and June 30, 2008. Purchases declined in the 2 years following that period. The more comprehensive capital asset data described above allow us to report a more complete picture of the overall condition of bus-related assets. 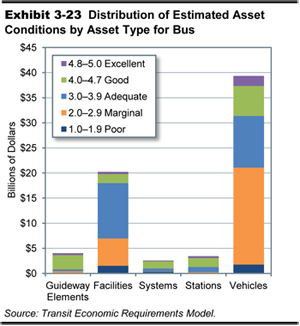 Exhibit 3-23 shows TERM estimates of current conditions for the major categories of fixed-route bus assets. Vehicles constitute roughly half of all fixed-route bus assets and maintenance facilities make up another third. Roughly one-third of bus maintenance facilities are rated below condition 3.0, compared to roughly one-half for bus, paratransit, and vanpool vehicles. The NTD collects annual data on all rail vehicles; this data is shown in Exhibit 3-24 broken down by the major categories of rail vehicle. Measured across all rail vehicle types, the average age of the Nation’s rail fleet has remained essentially unchanged, averaging between 19 to 20 years since 2004. The average condition of all rail vehicle types (calculated as the weighted average of vehicle conditions, weighted by vehicle replacement cost) is also relatively unchanged, remaining near 3.5 since 2000. The percentage of vehicles below the state of good repair replacement threshold (condition 2.5) has remained in the range of 3.6 to 4.6 percent since 2002. Note that, although this observation holds across all vehicle types, the analysis suggests that the majority of lower condition vehicles are found in the light and heavy rail fleets. It should be noted, however, that the majority of light rail vehicles with an estimated condition of less than 2.5 are historic street cars and trolley cars with an average age of 75 years. Given their historic vehicle status, the estimated condition of these vehicles (driven primarily by age) should be viewed as a fairly rough approximation. Source: Transit Economic Requirements Model and National Transit Database. During the period from 2000 to 2010, the Nation’s rail transit fleet grew at an annual average rate of roughly 2.0 percent, with this rate of growth largely determined by the rate of increase in the heavy rail fleet (which represents just over half of the total fleet and which grew at an average annual rate of 1.5 percent over this time period). In contrast, the annual rate of increase in commuter rail and light rail fleets has been appreciably higher, averaging roughly 3.1 percent and 5.2 percent, respectively. This reflects recent rail transit investments in small- and medium-sized urban areas whose size and density do not justify the greater investment needed for heavy rail construction. 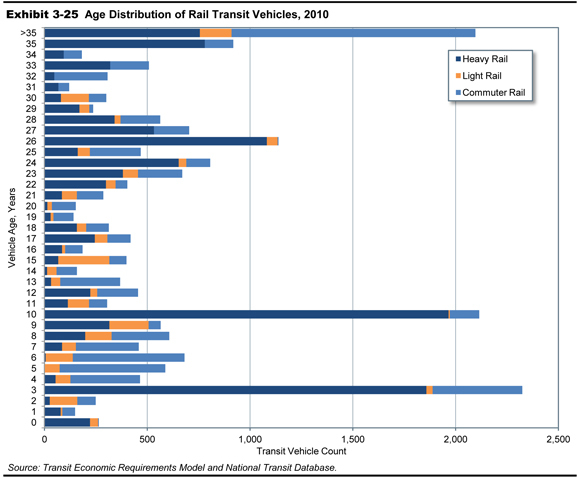 Similarly, Exhibit 3-25 presents the age distribution of the Nation’s rail transit vehicles, emphasizing that heavy rail vehicles account for more than one-half of the Nation’s rail fleet whereas light rail, a mode typically found in smaller rail markets, only accounts of 10 percent of rail vehicles. At the same time, roughly one-third of rail and commuter vehicles are more than 25 years old—with close to 2,000 heavy and commuter rail vehicles exceeding 35 years in age. It is instructive to compare the results in Exhibit 3-25 with the age distribution of transit buses and vans in Exhibit 3-22; while the latter show a comparatively clear pattern of preferred retirement age by bus and van vehicle type, this pattern is absent from the rail vehicle results. Non-vehicle transit rail assets can be divided into four general categories: guideway elements, facilities, systems, and stations. TERM estimates of the condition distribution for each of these categories are shown in Exhibit 3-26. The largest category by replacement value is guideway elements. These consist of tracks, ties, switches, ballasts, tunnels, and elevated structures. The replacement value of this category is $213.0 billion, of which $35.8 billion is rated below condition 2.0 (17 percent) and $22.6 billion is rated between condition 2.0 and 3.0. 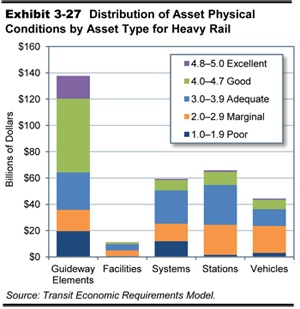 The relatively large proportion of guideway and systems assets that are rated below condition 2.0 and the magnitude of the $49.5-billion investment required to replace them represent major challenges to the rail transit industry. Although maintaining these assets is one of the largest expenses associated with operating rail transit, FTA does not collect detailed data on these elements, in part because they are hard to break down into discrete sections that have common life expectancies. Service life for track, for example, is highly dependent on the amount of use and on location factors. Systems, which consist of power, communication, and train control equipment, represent the next largest category. These assets have a replacement value of $93.6 billion, of which $13.7 billion is rated below condition 2.0 (19 percent) and $15.3 billion is rated between condition 2.0 and 3.0. This is another category where many assets are difficult to characterize according to standard types and life expectancies. As a result, FTA has only limited data from which to make needs projections. Stations have a replacement value of $83.8 billion with only $2.3 billion rated below condition 2.0 and $23.8 billion rated between condition 2.0 and 3.0. Facilities, mostly consisting of maintenance and administration buildings, have a replacement value of $28.1 billion with $1.8 billion rated below condition 2.0 and $7.0 billion rated between condition 2.0 and 3.0. Rail transit consists of heavy rail (urban dedicated guideway), light rail (in mixed traffic), and commuter rail (suburban passenger rail) modes. Almost half of rail transit vehicles are in heavy rail systems. Heavy rail represents $318 billion (64 percent) of the total transit rail replacement cost of $547.6 billion. Some of the Nation’s oldest and largest transit systems are served by heavy rail (Boston, New York, Washington, San Francisco, Philadelphia, and Chicago). The condition distribution of heavy rail assets, which represent the largest share of U.S. rail transit assets, is shown in Exhibit 3-27. All transit vehicles owned by rural systems are buses, vans, or other small passenger vehicles (see Chapter 2). Data on the number and age of rural vehicles and the number of maintenance facilities is now collected in the NTD, allowing FTA to report more accurately on rural transit conditions and on the 682 rural maintenance facilities that were reported. 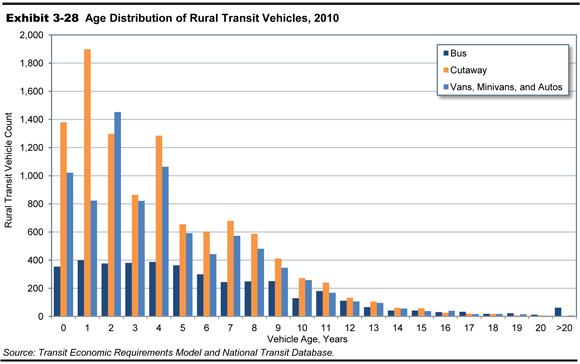 The age distribution of rural transit vehicles is summarized in Exhibit 3-28. For 2010, data reported to the NTD indicated that 8.1 percent of rural buses, 18.4 percent of cutaways, and 38.6 percent of rural vans were past their FTA minimum life expectancy (12 years for buses, 7 to 10 for cutaways, and 4 for vans). The rural transit fleet had an average age of 4.5 years in 2010; buses, with an average age of 5.9 years, were older than vans and cutaways, which had an average age of 4.1 years and 4.4 years, respectively. Overall, 33.3 percent of the U.S. fleet was more than 5 years old.